Economist Herb Stein famously said that something that can't go on forever, won't. For decades now, America has been putting ever-growing amounts of money into its K-12 education system, while getting steadily poorer results. Now parents are losing faith in public schools, new alternatives are appearing, and change is on the way. 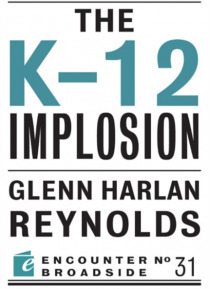 The K-12 Implosion provides a succinct description of what's wrong, … and where the solutions are likely to appear, along with advice for parents, educators, and taxpayers.